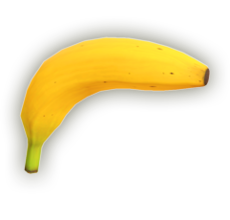 Can fire a single explosive shot and can be used as a normal banana peel. The Banana Gun is an item which appears in Super Smash Bros. Ultimate. It appears as a regular banana that can be fired once, exploding on contact. After it is fired, it can be used as a regular banana peel. This page was last edited on March 19, 2019, at 07:21.